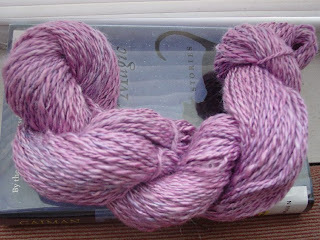 I finally finished spinning this silk up. 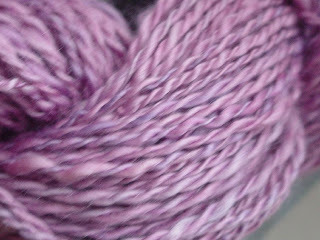 I received it from Yarn Mafia in a craftster.org roving swap last year. Its very pretty and the colors range from pink to purple. Unfortunately I seem to have a hard time with taking pictures of silk. The light just bounces off the silk and into the camera. Also, this is my next work in progress. Now that I have a ballwinder, I'm going to make this a nice two-ply. 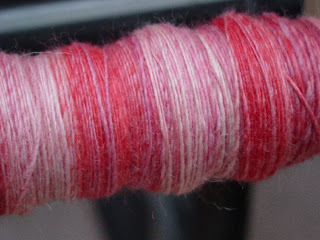 Originally this was listed in my store as a roving but I got an itch and needed to spin. If it turns out nicely, I might have to pull the other one too. Really like that pink.... It's awfully hard to leave our dyed roving in our shops, isn't it? They just scream out to be spun.